Be glad, let earth be glad, as glory floods her, ablaze with light from her eternal King, let all corners of the earth be glad, knowing an end to gloom and darkness. Hi everybody, Bishop Callahan here. Christ is Risen! He is Risen Indeed! Alleluia! The eternal King has shown His glory; Christ has risen from the dead. Just imagine what it must have been like for the first witnesses of Christ’s Resurrection. When we hear the accounts of his Resurrection this Easter Season, try to listen with new ears and be ready to get caught up with the same excitement of the first witnesses. Are we any less amazed, less confused, or less confident to tell others of what we know to be true? Today we too give witness to Christ’s Resurrection. We remind ourselves, as the early witnesses did, that Jesus promised to be with us until the end of time. There are many people who join the Church at the Easter Vigil. There are many more whose Faith is strengthened by the Easter celebrations. Consider recommitting yourself this Easter Season to spread the Good News. You will notice that Holy Water is used during the Easter Masses. This sprinkling is to remind us of our particular Baptism, and the life of grace to which we are called. Water, so simple and pure, so common made Holy to cleanse us from our sins and give refreshment to our souls. This Easter Season, let your joy radiate in your life. Give witness to the stupendous act of love by Jesus Christ. Blessed Easter to you – and I’ll see you at Sunday Mass! This entry was posted in Uncategorized on April 20, 2019 by dioceseoflacrosse. I often hear the song: “Go, Make a Difference” sung at Confirmation celebrations across the diocese. I think it’s a good song because it reminds us of our great Servant of God, Father Joseph Walijewski, who really did make a difference in Bolivia and Peru and even here in Thorp, Colby and La Crosse. The missionary spirit is right under our noses, if we take the time to see it. Sunday is the feast of the Great Irish Patron, Saint Patrick, who himself was a missionary to Ireland. Can you imagine Ireland without Saint Patrick? Almost impossible. Sunday, however, is the Second Sunday of Lent and the sixth anniversary of the initiation of the Cause for the Beatification and Canonization of Fr. Joe. A special Mass will be offered at 10:30 a.m. at our Cathedral to pray for the Canonization of Fr. Joe and to remember in a special way all the intentions that are being offered to God through his intercession. If you are unable to attend the Mass, you can watch the livestream. Everyone is happy to know that his Cause is moving along, slowly but surely, at the Congregation for the Causes of Saints in Rome. Our daily prayers to God for Fr. Joe to be recognized and proclaimed as a Saint is, of course, a job for all of us. So, please keep praying and ask Fr. Joe to help in situations in your life where a “little miracle” might be necessary—we believe in miracles and God is willing to grant them for us, if we ask. We can always use a little help with our prayers; the Communion of Saints is great place to start. I invite you to please ask God, through the intercession of Fr. Joe, for help in your daily life with tasks and difficult moments or whatever. Ask and you will receive—especially this Sunday. Secondly, I want to remind you that the missionary spirit is still very much alive in our diocese! Our Mission Office coordinates trips with Casa Hogar throughout the year to visit the children and offer a bit of spiritual, as well as physical support in Peru. Great idea for a parish event! You may also be inspired by Fr. Joe’s life to get involved in some “home missionary” adventures. Check out the Mission News on our diocesan website for some great ways in which you may choose to follow Fr. Joe’s missionary spirit in your parish community. This entry was posted in Uncategorized on March 15, 2019 by dioceseoflacrosse. Hi Everybody, Bishop Callahan here, inviting you to fully experience this season of Lent. Full of pious practices, Lent gives us reason to change our routine, refocus our prayer life, and let the Holy Spirit illuminate our minds and hearts so we can better receive the Word of God. As you approach Lent this year, consider spending more time in Eucharistic Adoration. Make time, in the presence of God, to pray for an increase in one of the Gifts of the Holy Spirit. Actively engage in seeking guidance from the Holy Spirit. Lent also allows us to make time for quiet, to listen and to remind ourselves that everything we do has social consequences. When you look at what you are doing, what you have done, and what you have left undone, never loose site of the communal effect of sin. Sin is not personal, it’s impact will be felt by so many other people. Lent should awaken in us the virtue of penance, namely detesting sin because it offends God. I encourage you to make a good Confession this Lent, pondering how you have separated yourself from the loving embrace of God. Pray that through the Sacrament of Penance you will come to know Jesus in a deeper and more profound way. He desires us to experience eternal happiness with him in heaven. Examine your hearts, discipline your will, and make ready to fully embrace the risen Savior on Easter! Blessed Lent to you. Let us walk together on our ascent to the Holy Mountain of Easter. This entry was posted in Uncategorized on March 6, 2019 by dioceseoflacrosse. I don’t think it’s a big secret to anybody that I am a big fan of Catholic education and that I am concerned about the impact Catholic education has on our society. Our work in Catholic schools promotes the positive understanding of how Catholic schools advance spiritual growth, academic scholarship, and good citizenship for you, the future generation of our beloved country and the growth of understanding for people of good will in our everyday lives. Catholic education allows Christ to be present in everything we do each day. In our schools you not only achieve academic excellence but together we foster a spirit of community and service. When you serve in the name of Jesus, you are letting His love shine forth through your actions. You are also learning how to be leaders in your church and communities. I will be traveling through our Diocese to celebrate the Mass at many of our Catholic schools and spending some time visiting with you and praying with you during Catholic schools’ week. I take this opportunity to extend my thanks to all of you who promote and work for the advancement of Catholic schools in our Diocese. In addition, I thank all of you good young people, our students. You, your parents, and your teachers make our Catholic schools such a great gift to our community. Finally, thanks to our priests and deacons, your support means so much to me personally. This entry was posted in Uncategorized on January 28, 2019 by dioceseoflacrosse. When I was a little boy, I often remember being told to only speak when I was spoken to—in other words, “Children should be seen and not heard.” I always had trouble with that old canard; I suppose I always had “something” to say and I figured someone should listen. Children are like that: seeking and needing attention. Sometimes it’s “cute” and sometimes it can be annoying. In a homily concerning the Holy Family of Nazareth, delivered in 2005 (30 December 2005), His Holiness, Pope Emeritus Benedict XVI offered a similar insight for our consideration. He reminded us that God does not impose Himself, He never uses force to enter our lives; rather, the Pope notes that God asks, as child does, to be welcomed. In a certain sense, God too presents Himself in need of attention: He waits for us to open our hearts to Him, to take care of Him. The innocence and vulnerability of a child is one of the most important elements that we learn in our contemplation of Christmas—of the Incarnation itself. Amazingly, God makes Himself vulnerable to us and for us. St. Augustine and St. Thomas Aquinas offered similar teaching, helping us to ponder that as God wanted us to be sharers in His divinity, He in His humanity might make men more like gods. God speaks in simplicity and example. As we listen at Christmas, and all throughout the year in holiness and the practice of the sacramental life of the Church, we become more childlike, closer to the image of the Child—the Man Jesus. Listen in stillness and peace and have a Blessed Christmas. 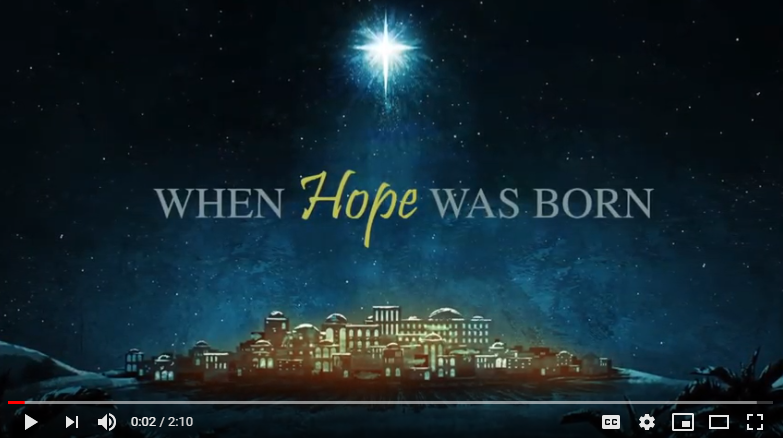 This entry was posted in Uncategorized on December 24, 2018 by dioceseoflacrosse. The days are coming, says the Lord, when I will fulfill the promise I made to the house of Israel and Judah. Bishop Callahan here, reminding you of the great gift that was promised to us through the prophet Jeremiah. The promise of a Savior, to free us from our sins. The promise of Jesus Christ! This Advent season our Gospel readings will be taken from the Gospel of Luke; we will hear accounts of the Annunciation and the Visitation. We will see Isaiah’s prophecy of the birth of John the Baptist be fulfilled, and we will be reminded to be vigilant at all times; praying for the strength and courage to remain strong in our Faith. I encourage you to incorporate this Advent time of preparation and waiting into your daily routine. Can you include a short prayer early in the morning as you prepare your breakfast? Or perhaps while you wait in traffic or for a family get-together, remember a time when you felt God’s presence in your life? Commit to increasing your time of witness to others and to yourself. The Lord has done great things for us; we are filled with joy. This Advent season, let your inner joy animate your thoughts, radiate through your actions, and overtake your very being so that your hearts are fully open to welcome the Christ child this Christmas. Blessed Advent to you; let us wait together in prayer. This entry was posted in Uncategorized on December 3, 2018 by dioceseoflacrosse. 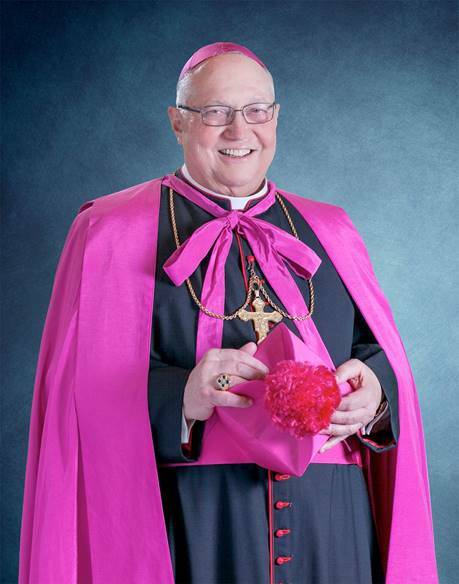 Bishop William Patrick Callahan and the people of the Diocese of La Crosse wish to express their condolences on the death of Bishop Robert C. Morlino, 4th bishop of the Diocese of Madison. Bishop Morlino died on Saturday, November 24th, at St. Mary’s Hospital in Madison. He was ordained to the priesthood on June 1, 1974, for the Society of Jesus, later becoming a priest of the Diocese of Kalamazoo. On July 6, 1999, Pope Saint John Paul II appointed him the Ninth Bishop of Helena. Later he was appointed bishop of Madison on May 23, 2003, and installed on August 1, 2003. He was very active throughout his distinguished service to the Diocese of Madison, most notably his work building up priestly vocations, liturgical reverence, and ministry to the larger community. Funeral arrangements are pending. Visit the Diocese of Madison’s website for more information. Here is the link to the full announcement. Please remember Bishop Morlino and the Diocese of Madison in your prayers. Eternal rest grant unto him, O Lord, and let perpetual light shine upon him. May his soul, and the souls of all the faithful departed, through the mercy of God, rest in peace. This entry was posted in Uncategorized on November 25, 2018 by dioceseoflacrosse. The bishops of the United States are joining together in a commitment of prayer and reparation leading up to our General Assembly, where we will be making critical decisions in response to the clergy sexual abuse crisis. With my brother bishops across the nation, I will be dedicating myself to seven days of intensified prayer and fasting from Monday, 5 November, through Sunday, 11 November. For the healing and support of all victims of clergy sexual abuse. For the conversion and just punishment of the perpetrators and concealers of sexual abuse. For the strength of the bishops to be holy shepherds in protecting and leading our sheep from all harm. If you feel called to do so, you are welcome to join me in praying for these intentions. I would also be grateful for any prayers for me and my brother bishops during our general assembly, that we may follow the guidance of the Holy Spirit in responding to the tragedy of clergy sexual abuse in the Church. Please be assured of my prayers for you, as well. This entry was posted in Uncategorized on November 5, 2018 by dioceseoflacrosse. This week I begin my annual retreat with my brother bishops from Indiana, Illinois, and Wisconsin. This is usually a welcome event for us to simply “come aside and rest a while” with Our Blessed Lord. I doubt, however, that we will be finding quiet rest and prayer as much as we will be sharing our deepest and profoundly sad feelings concerning the events that once again plunge the Church into a dark hour of shame and disappointment—especially in Her leadership. The first news about Archbishop McCarrick was indeed shocking and upsetting. That sad news was followed by the revelations concerning the unraveling of the incredible and disgusting stories of sexual molestations that took place over the decades in so many parts of the Church in Pennsylvania. Of course, I am personally touched and deeply grieved by these events—not only because I am a bishop, but because so many of the faithful are being struck with the tragedy of having their faith assaulted once again. My brothers and sisters, be strong in your faith in these difficult days. Yes, there is sin and evil action abounding around us. Sadly, that evil has come about from some of the very shepherds who were supposed to protect us. Yes, there still is sin in the world, even though the devil has been defeated by the power of the Cross of Christ. More than ever, we must cling to the cross, pray with the Scriptures, and receive the Sacraments. Continue to pray for good and holy priests. They need your prayers to remain courageous in these days. If we want good priests (and bishops) we must pray for them! Jesus told His First Priests that they were the salt of the earth—the light of the world. He called them to courage and virtue in living and preaching the Gospel. I pray for you, dear brothers and sisters, especially for all who have been sadly touched—once again—by the sin and sadness of abuse in the Church and in the world at large. Remain faithful and strong—Jesus Christ has conquered evil. His is the Power. His is the Glory! This entry was posted in Uncategorized on August 20, 2018 by dioceseoflacrosse.